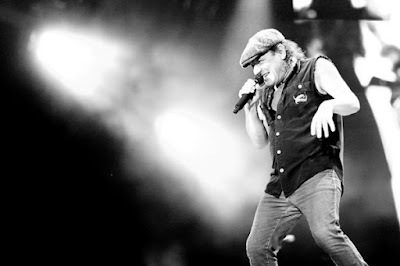 According to a new report by US rock radio DJ Eddie Trunk, AC/DC will tour in support of a new album with Brian Johnson. "I think AC/DC... it's pretty much a done deal that these guys are gonna make a record or have made a record and a record is gonna come out," said Trunk during the April 11 broadcast of his show (hear audio below). “I have sources that have told me that they are absolutely going to tour with Brian back again. That's all unconfirmed from their camp, but I had it from some reliable sources." "I think it's pretty much a done deal that AC/DC at the very least are going to release some sort of record,” he continued, “and it'll be some sort of record, and it'll be some sort of tribute to Malcolm [Young] just like ‘Back In Black’ was a tribute to Bon [Scott]. “So I have no doubt about that and I'm pretty confident they're probably going to do shows, as well. but I think at this point it's pretty much just when they announce it." Trunk’s report follows recent confirmation of studio activity from longtime AC/DC engineer Mike Fraser – who worked on the group’s past five studio records – and sightings of band members last summer at a Vancouver recording studio. The appearance of Johnson at the 2018 sessions was a surprise; the singer left the group’s “Rock Or Bust” tour in the spring of 2016 after being advised by doctors that he was risking total hearing loss; at the time, the rocker began working with the inventor of in-ear monitors, Asius Technologies founder Stephen Ambrose, to find a technical solution that would allow him to perform live again someday. Johnson made his live return in May 2017 when he joined Robert Plant during a guest spot at a Paul Rodgers show in Oxford, UK, and a performance of the band’s 1980 classic, “Back In Black”, with Muse at the Reading Festival that same year, as well as a March 2018 guest spot with Mick Fleetwood in Maui, Hawaii. Last fall, rumors surfaced about a possible new AC/DC album that may feature unused recordings by Malcolm, who passed away in 2017 at the age of 64. There’s been no official comment or word from AC/DC’s camp to date regarding the group’s plans moving forward.